How does global change affect ecosystem function? As ecophysiologists, we investigate this question by studying how the environment (both physical and biological) interacts with the physiology of an organism. The global change factors we investigate include climate change, changes in nutrients, landscape disturbance, and non-native species invasions. Our research that spans many scales in biology, is highly inter-disciplinary, and demands collaboration. More specifically, our research focuses on several key questions, which often interact to affect an ecosystem. These include: (1) how does climate change affect ecosystem processes, (2) how do invasions from nonnative species (plants and insects) affect ecosystems, and (3) how can experiments and data analysis be used in a way to make meaningful predictions of ecosystem responses? Traditional boundary lines do not limit this research program; we deeply believe in forming unique interactions and collaborations to understand and communicate the world’s most pressing global change problems. Eastern US forests are losing a foundation tree species, the eastern hemlock (Tsuga canadenis) due to the exotic insect pests hemlock woolly adelgid (Adelges tsugae, HWA) and elongate hemlock scale (Fiorinia externa, EHS). Eastern hemlock, an evergreen conifer, is a foundation species, as it structures avian communities, ant and benthic invertebrate stream communities, and creates a unique forest floor environment. The widespread destruction of this species has large ramifications for ecosystem processes and other species that depend on it for survival. An “accidental experiment” was initiated by patch-level timber harvesting of hemlock trees ~30 years ago, which has led to the ideal experimental setup to test for long-term changes in ecosystem function. Destroyed hemlock forests are typically replaced by deciduous tree species, such as black birch (Betula lenta). My research focuses on understanding changes in ecosystem function as these hemlock forests transition to black birch forests at MFS. Aliza Fassler, Jesse Bellemare, and I have submitted a new paper to Northeastern Naturalist. This paper encompasses fungi and soil data collected by Aliza Fassler and Dr. Bellemare, and bacteria counts collected by my lab group. 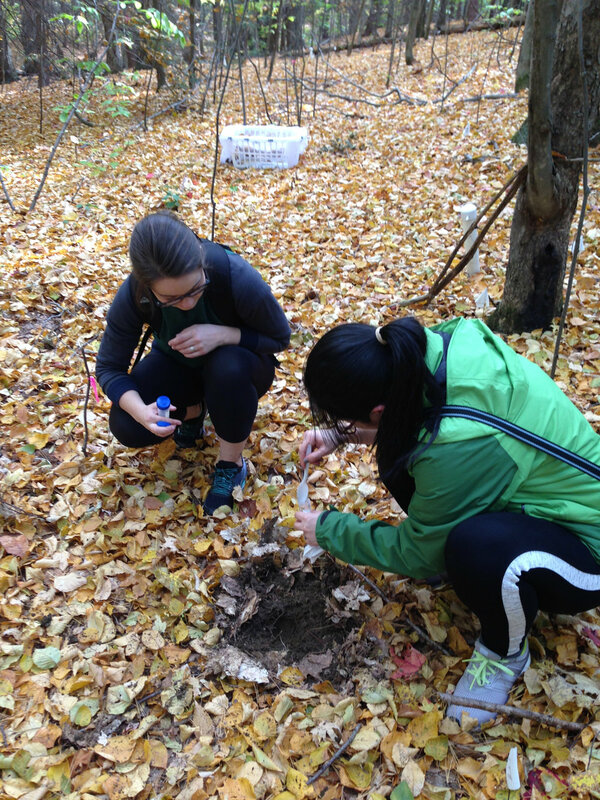 Given the drastically different soil nutrient levels, organic soil mass, and soil respiration in hemlock and black birch forests, there are differences in the soil microbial community affecting decomposition. I have a solo authored paper that is in preparation to be submitted Fall 2018. 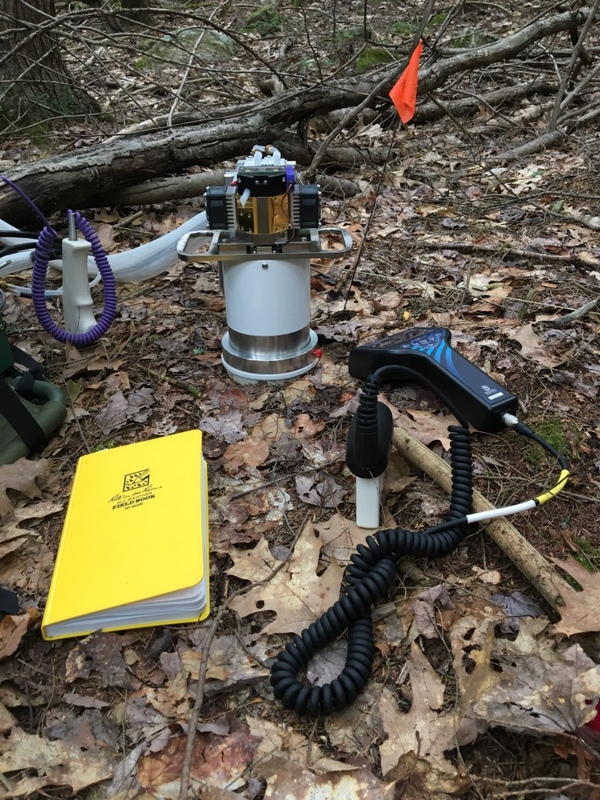 I sought to address how the temperature sensitivity sensitivities (R10 and Q10) of soil respiration vary as eastern hemlock forests transition to mature black birch forests. Through this study, I am able to evaluate the role of soil moisture and temperature in influencing R10 and Q10 across multiple years (2015-2017). Our field site near Portal, AZ. I have been working on a Chihuahuan Desert ecosystem since 2007. This research focuses on understanding the mechanisms and impacts of a non-native plant species. A non-native Eurasian winter annual plant species, Erodium cicutarium, has been implicated in driving down the native biodiversity and abundance in Arizona and many parts of the U.S. However, a native plant, Astragalus nuttallianus, has also increased its abundance in recent years. Removing Erodium cicutarium actually decreased the abundance of native species, except for Astragalus nuttallianus. These two species co-dominate this system, with the potential for facilitative interactions. My multi-year large-scale field and lab experiments investigating the role of climate change and pollution (nitrogen deposition) in the invasion have been very successful and have yet to be published. Surprisingly, climate change was not found to be the main driver of invasion success nor community change over time. Seasonal climate characteristics determined years with guild success. A full-factorial experiment with invasive removal, water timing, and nutrient levels. The lab is currently (Fall 2018) working on plant competition experiments to investigate the relationship between Erodium cicutarium and Astragalus nuttallianus. Different combinations of these species are being exposed to two temperature and two water treatments in our growth chambers. We currently have a manuscript in preparation, which focuses on seed interactions of these co-dominant species.